Tom Brady's NFL Suspension Upheld By Federal Appeals Court : The Two-Way A three-judge panel overturned a lower court's ruling that found NFL Commissioner Roger Goodell was not fair when he handed down the suspension. 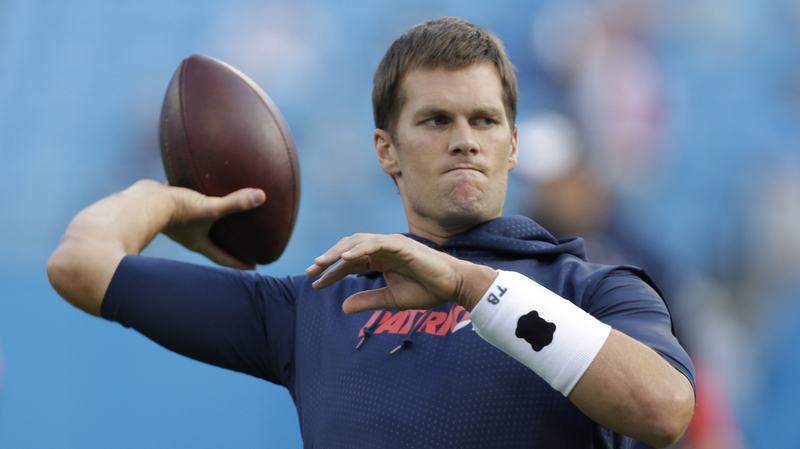 New England Patriots' Tom Brady warms up before a preseason game against the Carolina Panthers on Aug. 28. A federal appeals court has reinstated Tom Brady's four-game suspension over his involvement in the "Deflategate" scandal. In a 2-1 decision, a three-judge panel of the 2nd U.S. Circuit Court of Appeals overturned a lower court ruling that found NFL Commissioner Roger Goodell was not fair when he handed down the suspension. As we reported at the time, U.S. District Judge Richard Berman did not take issue with the facts of the case, instead chastised Goodell for what he called "significant legal deficiencies" in the way he handled the case. Overturning that decision, the 2nd Circuit judges ruled that Goodell had "properly exercised his broad discretion under the collective bargaining agreement and that his procedural rulings were properly grounded in that agreement and did not deprive Brady of fundamental fairness." In his dissent, Chief Judge Robert Katzmann made some of the same arguments that the lower court did. Mainly, Katzmann argues, that Goodell acted unfairly because when he changed the factual basis for disciplinary action after the hearing, he denied Brady a chance "to confront the case against him." Writing for the panel, Circuit Judge Barrington D. Parker says that labor law means that a federal court has to be "highly deferential" to the decisions made during arbitration. What's more, the collective bargaining agreement between the League and the players gives Goodell broad authority, the court writes. So, while the court agreed that, indeed, Goodell didn't allow Brady to confront the case against him, that right was not guaranteed by the collective bargaining agreement. "Had the parties wished to allow for more expansive discovery, they could have bargained for that right," the court wrote. "They did not, and there is simply no fundamental unfairness in affording the parties precisely what they agreed on." According to The Associated Press, Brady can now ask the full 2nd Circuit to hear the case or he can appeal to the U.S. Supreme Court. Brady can also ask the court to put his suspension on hold while he appeals.